Mexican Flame VineSemi-deciduous vine, evergreen in mild climates. Dark green toothed leaves contras..
Purple Potato VineEvergreen vine. 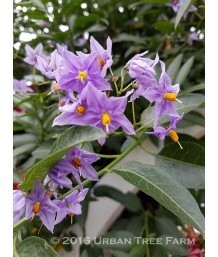 Blue-purple flowers that start in March and continue until Novembe..
Purple Potato VineEvergreen vine. Trained to grow along an upright stake in the center of the contai.. Potato VineEvergreen vine. Fast growing. Needs support. Small dark green narrow pointing leaves turn..
Variegated Potato VineEvergreen vine. Fast growing. Needs support. Small dark green narrow pointing .. Potato VineEvergreen vine. Already trained to grow on a trellis. Fast growing. Needs support. Small ..